The fall season brings with it new produce to fill our refrigerators and tables. Across the country, we bite into crisp sweet apples and start getting reacquainted with our ovens. With restaurants increasingly using more local products and farm fresh ingredients, you can now find your favorite seasonal flavors when you are dining out. American Farmland Trust is celebrating delicious food and the farmers and land needed to grow it—while giving diners and restaurants a great way to support farms and farmland—during our second annual Dine Out for FarmsTM week from October 16 to 22. With participating restaurants in 22 states and Washington, D.C.—from Seattle, Washington, to Charleston, South Carolina—a wide range of locally sourced ingredients and dishes can be found to suit many tastes. Dine Out for FarmsTM restaurants are participating in a variety of ways. Check out your closest participating Dine Out for FarmsTM location and join the cause to help save farms and farmland. A special thanks goes out to our “Farmers’ Champion” restaurants: Founding Farmers, Jaleo, and Café Milano in the Washington, D.C. area and Galletto Ristorante in Modesto, California. We’d also love to hear what farm fresh meals you are enjoying at participating restaurants during Dine Out for Farms TM week! Please share in the comments section below or join the conversation on Twitter at #dine4farms. About the Authors: Delancey Nelson is a Marketing Intern with American Farmland Trust. She has worked on numerous farms and vineyards abroad and holds a degree in Historic Preservation and Community Planning from the College of Charleston. 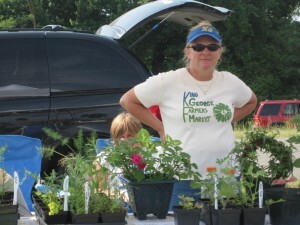 She is also the market manager of the Lauraville Farmers Market in Baltimore, Maryland. This entry was posted in Local Farms and Food, Uncategorized and tagged American Farmland Trust, Dine out for Farms, farm to table, local food, restaurant week on October 17, 2011 by admin. What do the seasons taste like? Does April’s first asparagus mean the shedding of winter’s chill? And does butternut squash suggest autumn? Chef Mike Isabella receives a No Farms No Food hat from American Farmland Trust President Jon Scholl. For Mike Isabella, chef/owner of Graffiato in Washington, D.C., it is the other way around: the seasons bring the flavor of local. “Top Chef” finalist Isabella has joined dozens of chefs and restaurateurs across the country for the second annual Dine Out for FarmsTM week, where chefs demonstrate their support for local farms through their gifted culinary talents. The event, held from October 16-22, is a celebration of delicious food and the farmers and land needed to grow it. The connection between local farms and restaurants has been growing steadily over recent years. 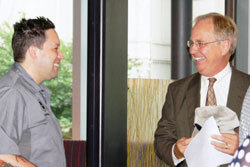 According to the National Restaurant Association, top menu trends in 2011 have centered on locally and sustainably sourced food items. For Isabella, working to source the freshest ingredients at his restaurant is more than an appeal to consumer demand. About the author: Erica Goodman is the Communications Associate with American Farmland Trust. This entry was posted in Farmland Protection, Local Farms and Food and tagged American Farmland Trust, Dine out for Farms, Graffiato, local food, Mike Isabella, Top Chef on September 22, 2011 by admin. The nation has its eyes on agriculture, with the U.S. Department of Agriculture recently celebrating National Agriculture Week and countless state and local organizations recognizing the importance of our working lands and the farmers and ranchers who manage them. However, since 1982, the U.S. developed 41 million rural acres—that’s one out of three acres ever developed in this country! Looking forward, with a third of farm operators now older than age 65, a huge transfer of land and resources is imminent. Given an estimated world population of nine billion people in 2050, even greater competition for land and water is looming on the horizon. With this expected population growth, how much land and water do we need to meet present and future demands for food, energy and environmental services? Have we already converted/diverted too much? How do we ensure conservation outcomes while preserving land and water rights? Recognizing tight budgets and multiple resource demands, 21st century solutions will require greater cooperation among agricultural producers, all levels of government and private-sector partners to focus on conservation outcomes instead of jurisdictional authorities. Toward this end, American Farmland Trust has partnered with USDA Natural Resources Conservation Service and Farm Foundation NFP to host a National Agricultural Landscape Forum in Washington, D.C., on April 7–8, 2011. 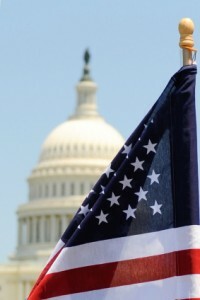 Guided by a Blue Ribbon Panel of leaders in agriculture and conservation, authorities from around the country will debate new policy approaches that are needed to sustain agriculture as a vital component of the nation’s landscape and to protect the health of the precious natural resources upon which our nation’s security depends. Regional roundtables are currently being held by Farm Foundation NFP to bring diverse “on-the-ground” perspectives to inform forum discussions. 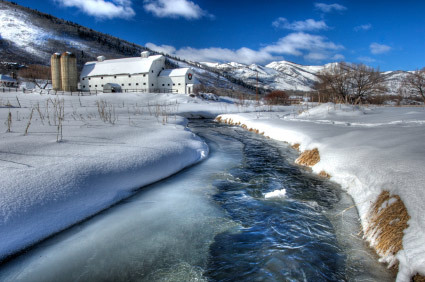 Outcomes from the roundtables and national forum are part of the public input process required by the Soil and Water Resources Conservation Act (RCA) and will be used to improve the efficiency and effectiveness of federal programs aimed at improving environmental quality and rural development. Creating opportunities to work together in a strategic, coordinated fashion is essential. How do we redesign the institutional structures we have now to reduce silos and promote partnerships among agencies, levels of government and producers? Finding ways to increase collaboration and share scarce resources is a sentiment shared by our national leaders. As Sen. Pat Roberts (R-Kan.), Ranking Member of the Senate Ag Committee, recently explained in a National Ag Day address, the future of federal agricultural programs is dependent on everyone working together. Sen. Roberts is forming plans with Senate Ag Committee Chairwoman Debbie Stabenow (D-Mich.) to hold farm bill hearings around the country to illuminate key issues in agriculture. With the pending opportunity to share opinions that could inform the outcome of the 2012 Farm Bill, the National Agricultural Landscapes Forum will provide an early incubator for ideas and solutions from a broad spectrum of agricultural and conservation interests. Engaging with a strong lineup of speakers and presenters, forum-goers will be involved in discussions that will shape future policy and determine the course of agriculture over the coming years. Deputy Secretary of Agriculture Kathleen Merrigan will carry on the energy of National Ag Week and kick off the forum as keynote speaker. A G Kawamura, former California Secretary of Agriculture and partner with us in the ground-breaking Ag Vision 2030 initiative, will present on “Foodsheds, Energy Sheds and Watersheds.” NRCS Chief Dave White will provide a venue to share a wide range of concerns as Blue Ribbon Panelists recap what they heard at the Farm Foundation NFP Regional Roundtables. Please join us, our partners and the Blue Ribbon Panel in a vigorous discussion about how to ensure the health and prosperity of the nation’s agricultural landscape. Register now for the opportunity to take part in this critically important dialogue. About the Author: Julia Freedgood is Managing Director for Farmland and Communities at American Farmland Trust. This entry was posted in Agriculture and Environment, Farmland Protection, Local Farms and Food and tagged agriculture, American Farmland Trust, conservation, farmland loss, Farmland Protection, local food on March 17, 2011 by Julia Freedgood. This is one in a series of posts highlighting the four winners of our summer long America’s Favorite Farmers Markets™ contest. Farmers often have a personal connection with their local public markets. Whether it’s the interaction with neighbors-turned-customers, or the added boost in revenue, regional markets offer a unique place for food producers to sell their goods. For market president Lonny LeFever, the Champaign County Farmers Market in Urbana, Ohio, is more than just a welcome location to sell his produce. It’s a reminder of what’s really important in life. The market is nestled in the historic section of Urbana. Held every Saturday from May to October, the Champaign County Farmers Market is a vendor-operated market in the truest sense. Every board of director member must be an active vendor, and the five-year plan calls for adding a second day to the market’s schedule, eventually using a permanent structure to hold a market five days a week. In 2008, the board of directors for the market decided to create a five-year plan. They started a “buy local, eat local” branding campaign, and managed to attract and retain about 28 vendors. LeFever says vendors take pride in their products, and the community and local government shows a great deal of support to their local market. The market tries to cater to the underprivileged residents in the county by accepting EBT Tokens and WIC. “We serve the whole community, not just the people that have the money to do it,” LeFever says. “We keep prices competitive to local stores.” The market also helps boost outside business. 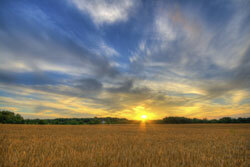 Visitors will drive into town, fill up on gas, eat downtown and purchase delicious food from the many family farmers. Winning a top award in America’s Favorite Farmers Market means quite a lot to LeFever. “It made me feel good,” he says. “I worked very hard to get it to this point, but I never thought we’d get this.” Since winning, the community is alive with support for their local market. LeFever spent much of his early life in Champaign County, so he is very familiar with the agricultural nature of the region. But at 16, when he graduated from high school, he moved away from home to try to make a life for himself away from his small hometown. A diagnosis of liver cancer brought him back home years later, and he says having cancer made him realize what’s really important. “We’re all given challenges in life,” he says. “You can either lie down and let them run over you, or you can say no, I’m not going to let that happen—I’m going to live.” Now at the age of 58, he’s been diagnosed with cancer four times, but each time he’s dug deeper to survive. Farming and the Champaign County market has certainly kept him busy, and helped him live a simpler, more focused life. Perhaps it’s the positive and welcoming atmosphere of the market that provided some extra strength during some hard times for LeFever. People come to the market, local restaurants bring hot coffee or ice tea, and customers end up sticking around to visit with their neighbors. This entry was posted in farmers markets and tagged American Farmland Trust, Champaign County, farmers markets, Ohio, Urbana on September 21, 2010 by admin. King George County is the quintessential rural Virginia setting, with about 22,000 residents calling the land between the Potomac and Rappahannock rivers home. The county prides itself on its family-oriented community feel, but without a major downtown setting, local schools often act as meeting centers. Now, thanks to the King George Farmers Market, residents have a place to gather alongside neighbors, shopping for the best local produce from the county’s many family farmers. The market opened in May 2009 thanks to a spark from grower Elizabeth Bewick. When it first opened, there were just three vendors. Later it grew to about a dozen producers, and during peak season, the Saturday market boasts up to 14 vendors. When establishing the market, a group of citizen-famers and food lovers decided the King George Farmers Market should only allow growers from within the county. So far, that concept works as the King George Farmers Market won in the boutique category for this year’s America’s Favorite Farmers Market. “I’m still completely overwhelmed we won this contest,” Padovan says. Given the relatively small size of the region, the farmers market acts as a gathering center for families and friends. The county boasts tremendous community participation, from the various activities at the King George High School to the local YMCA. The market joined events like a monthly family sing-along, a community appreciation day, and a colonial reenactment led by the local 4H Club, to grow community spirit. The local quilting club also shows its support through a raffle of two quilt patterns featuring different fruits and vegetables. Even students at the King George High School helped spread the word about the American’s Favorite Farmers Market contest through Facebook. It’s easy to see that the farmers market truly represents the community-centered mentality of the residents. Many in the county yearn for self sufficiency. To reach this goal, residents rely on the small network of food growers in the area. Padovan says this network is not just for food safety concerns, but also because it ends up being much more relevant for farmers and residents. “If we can take care of ourselves in this county, we are way better off,” she says. If you spend a Saturday at the market, which runs from May through Thanksgiving weekend, you’ll find local beef, fish, chicken and duck eggs, spring plants, herbs, and plenty of vegetables. But it’s not just the food that brings people out to the market. Padovan says one of the missions of the market is to educate through various outreach programs. In addition to classes on raising Shitake mushrooms and canning tomatoes, the market hosted a food film series in the winter and had presenters speak about regional feasibility. Looking to the future, Padovan says, “One of our missions is to grow more growers, starting with kids in the schools.” Fear of big-box retailers moving into the area makes Padovan and others associated with the farmers market even more eager to teach children about the importance of locally grown food. This entry was posted in farmers markets and tagged American Farmland Trust, Farmers Market, King George County, Rappahannock, Virginia on September 21, 2010 by admin. Last winter saw some of the most severe weather in the Washington, D.C. area. A handful of major blizzards literally brought the city and surrounding communities to a halt. Despite the impeding snow storms, the famers market in Falls Church, Virginia, a suburb of D.C., still drew vendors and customers. But even the popular Saturday market was not immune from the treacherous weather; for the first time in its 25-year history, the market shut down for one weekend. The Falls Church Farmers Market has a large, faithful base of consumers, drawing about 1,000 visitors during peak season. 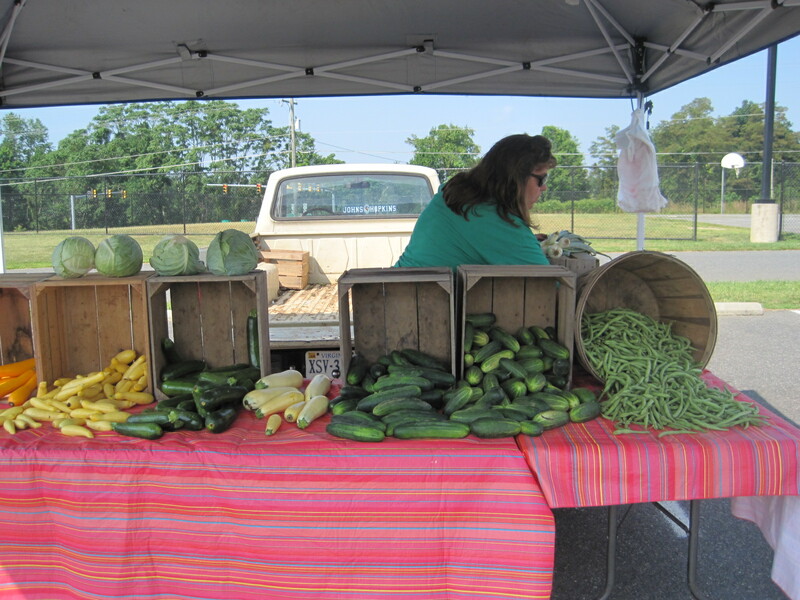 Many have attended the market for 20 or more years, looking for the best produce, meats and goods from area vendors. 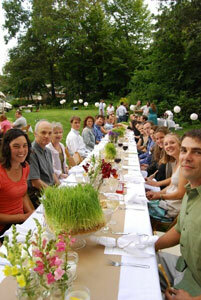 It’s a place to meet up with your neighbors, chat about food and get hands-on lessons from local growers. In its early days, the Falls Church Farmers Market struggled with attracting both producers and customers. But it wasn’t just luck that brought prosperity to the market. Herman explains that the market was heavily advertised after its early years, a time that saw only about six producers. The market was originally seasonal, but for the past four years the market shifted to a year-long event, drawing in about 45 vendors during peak season and dropping to 30 in the winter. The market saw a shift about 10 years ago when it became more diverse. Herman says the goal of diversifying the market was to make sure vendors were not just selling peaches, apples, tomatoes and corn. Now you can find baked goods, cheese, meats like sausage, beef and poultry, and other vendors there were not originally available at the market. “It’s a result primarily of us seeking out a more diverse product line,” Herman says. “But I also think it’s recognition that there are farmers who produce or grow things other than fruits and vegetables. There are quite a few beef, pork and lamb producers out there that we weren’t even touching at the market. 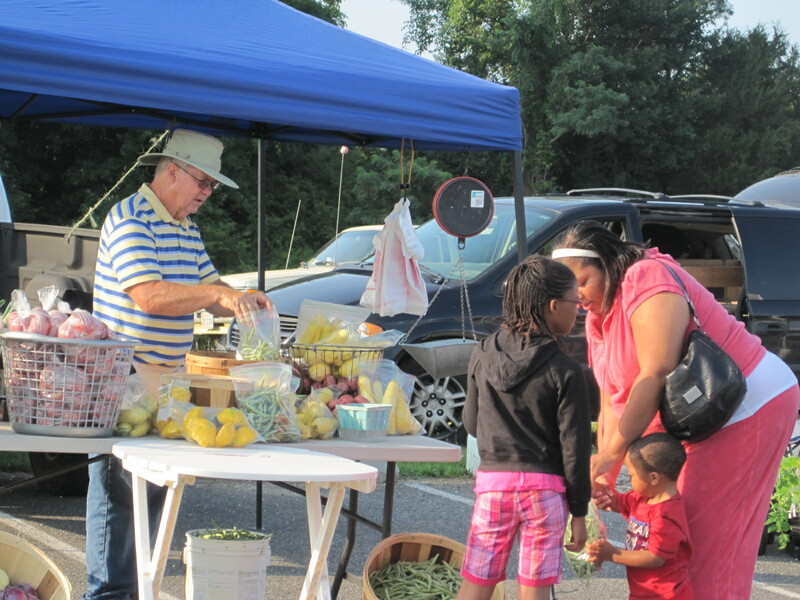 The market allows producers from within a 125 mile radius of the city of Falls Church. That means the market is filled with growers and producers from Pennsylvania, Maryland, Delaware, Virginia and West Virginia. 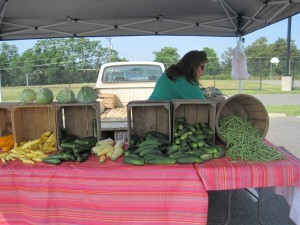 These local farmers markets help keep family-owned farms in business, Herman believes. While the locally grown food movement may have seemed like a fad 25 years ago when the market first opened, today it’s clear people yearn for food grown by people they can interact with. Farmers can sell directly to the consumer and not have to go directly through a wholesaler. For consumers, the market gives them a chance to talk directly with the farmers who produce their food. You can walk right up to a vendor and ask them about their okra or heirloom tomatoes, and see if they have any recipe ideas. This entry was posted in farmers markets and tagged American Farmland Trust, Falls Church, Farmers Market, Virginia, Washington DC on September 21, 2010 by admin. The condition, known as hypoxia, has serious repercussions for marine ecosystems. Nearly half of the 647 waterways in the study showed dead zones, with the Gulf of Mexico, the Chesapeake Bay Area and coastal waters of the Pacific Northwest topping the list. These unnaturally low levels of oxygen are largely due to human activities, including runoff from fertilizers used in agricultural production. Since 1998, American Farmland Trust has been working together with the agricultural community through our BMP Challenge to help farmers adopt conservation practices in sensitive watersheds. The program seeks to help farmers enhance their nutrient management practices and reduce fertilizer run-off that can impair local and regional water quality. With more than 9,200 acres in seven Midwest and Mid-Atlantic states enrolled, the BMP Challenge has effectively engaged farmers to test and adopt innovative approaches and spur improvements to policies and programs that support farmers’ adoption of environmentally sound practices. Thanks to initiatives like the BMP Challenge, progress in reducing nutrient runoff and mitigating the impact on regional waters is being realized. In one example, American Farmland Trust is working with farmers in coastal states committed to the Chesapeake 2000 Agreement to adopt conservation practices in a region that has seen increases in hypoxia for more than 30 years. Our goal is to continue to scale up the BMP challenge across the nation, matching it with our work on ecosystem services markets to create a future where farmers are an active part of securing cleaner water across the country. However, there is much more work to be done if we hope to truly protect our nations’ waters. And it is up to all of us to take part in that discussion. The BMP Challenge has been an effective tool for reducing nutrient runoff into nearby waterways. Join us in heeding the call to protect our precious coastal waters by expanding conservation opportunities before it is too late. This entry was posted in Agriculture and Environment, Water Quality and tagged American Farmland Trust, BMP Challenge, Chesapeake Bay, dead zones, Gulf of Mexico, hypoxia, Water Quality on September 17, 2010 by admin.